I live in a small house with very little closet space, not sure what these people where thinking when they built this house, but they forgot some really important things, like storage. Over the years I've learned how to hide most of my mess in baskets and thrift shop finds. I really need something nice to put my favorite books in my downstairs living room. It's a tiny place, just room enough for the TV, a chair and small couch. 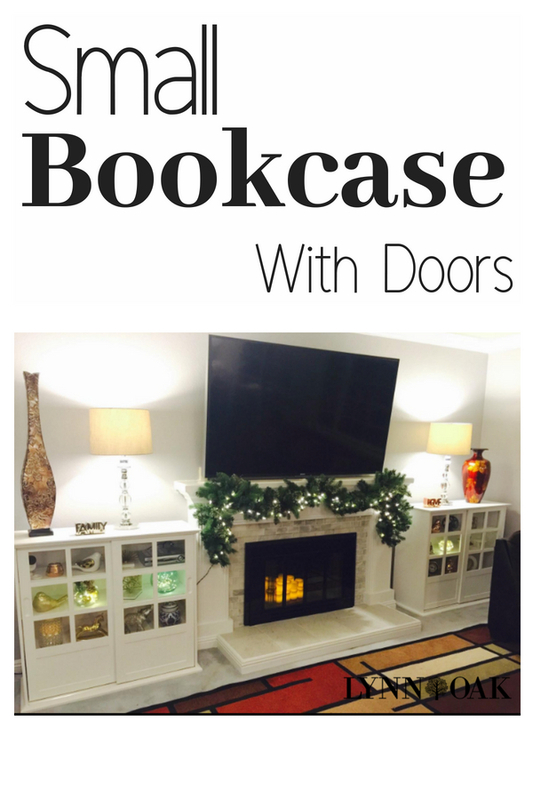 I'm looking for a small bookcase with doors that close to hide books and such in and still look nice when I shut the doors. It can't be overly big, I have to get it down the stairs. You should have seen my and hubs getting that couch down there, we ended up with it stuck and we had to tear up a wall getting it in the basement. Dry wall is not a fun thing to do and I don't want to do that again. It will need to have doors that close, to hide my messy book collection and things. I do all my crafts down there, so I could have a project hidden away there too. I've picked five from my favorite online store that I really like and hope that it will give you some ideas if you need some storage ideas for your books and things. I love the vintage look to this one, it will go with my farmhouse theme I have going on and go well with my thrift shop finds. It's 40W" x 15.5"D x 36.25"H a great size and I can get this down the steps with no trouble. I also like this brown one with double doors. It's 39" x 17" x 42" which will still fit down the stairs. I like the nickel hardware on this one too, very stylish. It's going to be tough to pick one of these. This one costs a little less than the other two I mentioned above, but the size 13" by 26" by 32" is about the same as the others. Still has the farmhouse look to it and would match my furniture perfectly. This one comes in three sizes and with stylish doors, if your looking for something a little different. It still is in the white color that I like, shabby chic looking. This one is brown and has more of a modern look to it. It's still a good size of 46.8 x 33 x 4.8 inches and has one door that you can't really see through. So if you super messy then this one might be the one for you.